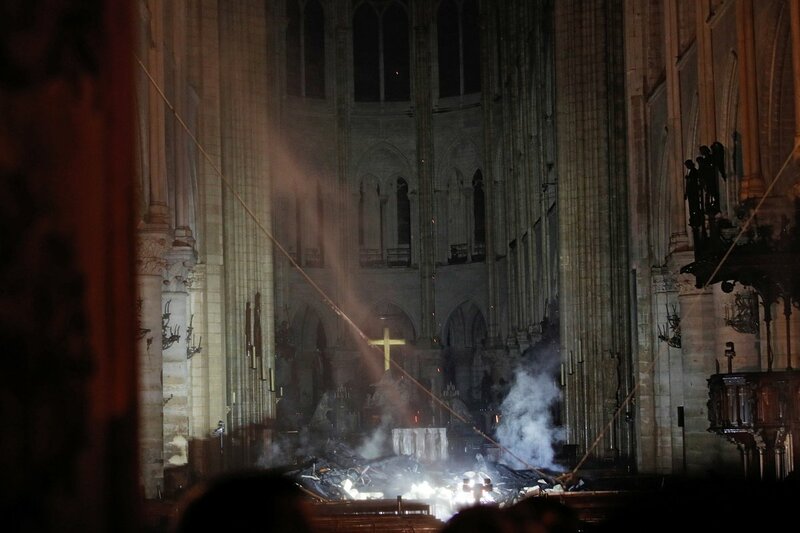 In a somber yet breathtaking photograph by Reuters Philippe Wojazer of Notre Dame Cathedral, the cross still stands! Notre Dame Cathedral caught fire in Paris on Monday, and it was up in flames for hours upon hours. As the dust settled, this photograph says it all. In this holiest of weeks for the Christian faith, this is one shining moment that our Lord is with us always. Through an inferno, and a massive blaze, that wooden cross of Calvary still stands my friends. We at the DC Patriot are thankful that not all is lost in the halls of Notre Dame Cathedral, it still stands, and the damage is not as bad as once thought. Looks like most the the building is still standing. Is this serious, you are actually claiming God is always with us because a cross is still stuck to the wall? You deluded types are dangerous!!! I mean, its a good pic, but a lot of the building didn’t burn along w the cross. Had it been in the middle of the blaze and rubble and still stood, that would have been legit amazing. Someone went in there and put that cross up, y’all stop it! Staging a picture for religious benefit, should be ashamed! Not surprised since they focused on keeping the fire at bay in that area of the cathedral. So the metal thing attached to stone didn’t burn? A golden stick didn’t fall down…. PRAISE JEEBUS. HE IZ LAWD. The candles never melted, but a metal cross on a stone all not burning you find amazing…. …. because gold melts at 1,948 Fahrenheit, and a wood fire would have reached 1,200 Fahrenheit at the most. But yes, let’s ignore science as always, because religious ignorance is preferable. God is good! It’s a reminder of WHO is in control. Thanks for sharing! You religious idiots are……Idiots. If the cross is still standing, why is that so amazing……How about the WHOLE cathedral not being burned…..Tards.